This page and site are under construction! While northern California struggles with rolling blackouts, Light Pollution continues unabated. This web site is about freedom from all forms of Light Pollution. Freedom from Sky Glow. Freedom from Glare. Freedom from Light Trespass. The Night Sky Belongs To Us All. It Is Part Of The Commons. Don't loose sight of the night, defend our views of the Milky Way. A review of issues relating to outdoor lighting along the Sacramento River and other locations. The above link was created in 2008, the threat continues and is made more critical by the drought. Much progress has been made so look for extensive updates to the Salmon and Light Pollution pages. Looking for a dark site in Norther California to observe from? Light Pollution, Astro -- addresses the how and why of Light Pollution and its effects on astronomy, both Amateur & Professional. Light Pollution, Visual -- addresses the how and why of Light Pollution related to lighting, light trespass, glare and vision. Light Pollution, Ecological -- addresses the adverse environmental effects of "Light At Night" (LAN) in all its form including Medical and disruption of night time habitat. Light at Night (LAN) and Health -- addresses the adverse environmental effects of "Light At Night" (LAN) on Human Health. Dark Parks and Dark Sky Preserves - “Starry night skies and natural darkness are part of the special places we protect." IDA California Section Activities from 2002-2008 -- a pictorial of Cal-IDA activities. Skykeepers and IDA California Section Mission Vision and Values -- from the old skykeepers pages. Natural Night Activism -- what can be done to combat Light Pollution on all fronts. Government Resources -- City, County, State Government links for the activists. 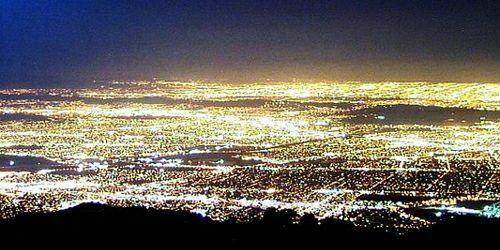 Good and Bad Lighting in the Central Valley- What are the major contributors to Light Pollution in the Central Valley? Astronomy -- links Antique Telescopes , Astro-Photography, Telescope Making and some Astronomy related Light Pollution links. Lighting Links -- links to all aspects of Light Pollution and Lighting.